A slip of the foot, the fall, months and years of efforts going up in smoke. In 2015, Romain Desgranges comes within a hair's breadth of winning the Climbing World Cup. He chooses to overcome his disappointment into the Californian desert of Joshua Tree. Only surrounded by "Big boulders", he confronts his fears by climbing solo these granite blocks, some of which reach heights up to 10 meters and more. Falling is forbidden; the fear of failure getting confused with the fear of dying. By exposing one to the other, Romain slowly finds his own path again. This maiden trip is at the core of the autobiographical work he started, soon joined by Flore Beaudelin, a graphic designer. 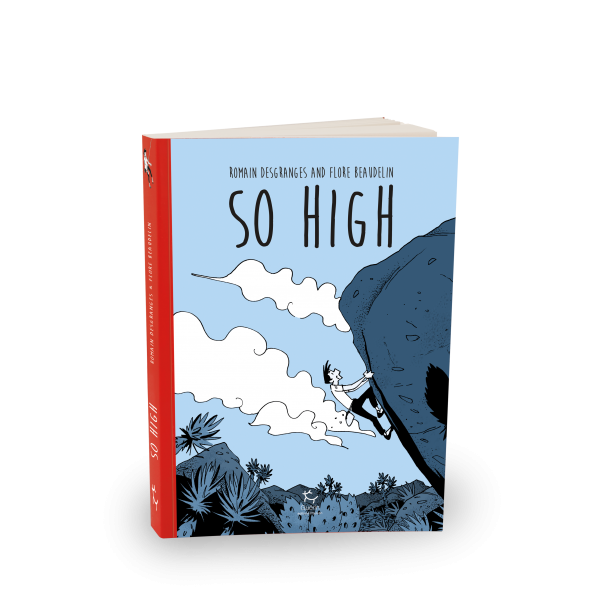 At first, there was a movie, then this graphic novel, to illustrate a lifetime journey through the passion of climbing. Eight chapters will follow Romain Desgranges from his childhood dreams to the World Cup podium. "So High" is the name given by the climbers to the highest of the boulders. Related links to "So High"
Customer evaluation for "So High"